OZZFEST MEETS KNOTFEST ticketing and camping packages include some unique offerings including a personal photo opportunity with BLACK SABBATH (Ozzy Osbourne, Tony Iommi & Geezer Butler), collectible and commemorative items, VIP "Fast Lane" entry into the festival, pit pass, reserved seating and VIP parking. These and many other amenities are available via a variety of ticketing packages (additional details below). Single day tickets range from $25.00 for GA lawn to $39.50-$149.50 for reserved seats, with GA pit passes starting at $99.00 for Sunday and $149.00 Saturday. Weekend passes range from $40.00 for GA lawn to $69.00-$239.00 for reserved seats, and $239.00 for GA pit passes. VIP packages start at $249.00 for VIP Lounge; options include the Ultimate SLIPKNOT VIP Experience at $1,000.00, the BLACK SABBATH M&G Package at $1250 and the Ultimate Ozzy Osbourne Experience at $2500. Camping selections include Tent Camping for $150.00 and RV Camping for $250.00. Additional details on camping and ticketing options can be found at OZZFEST.COM and KNOTFEST.COM. Tickets for the Live Nation-produced OZZFEST MEETS KNOTFEST go on sale Friday, May 20 at 10:00 AM (PT) at OZZFEST.COM and KNOTFEST.COM. Last week (Thursday, May 12) at the Palladium in Hollywood, CA, representatives from some of the 40 acts on the OZZFEST MEETS KNOTFEST bill gathered together to reveal the merger of two of the most well-known and established brands in rock--OZZFEST, celebrating its 20th anniversary,and KNOTFEST, which debuted in 2012. Beyond the festival namesakes Ozzy Osbourne (with Geezer Butler) and Corey Taylor (with fellow members, Shawn "Clown" Crahan and DJ Sid Wilson), Sharon Osbourne; David Draiman, DISTURBED; Scott Ian, ANTHRAX; Zakk Wylde, BLACK LABEL SOCIETY; Jamey Jasta, HATEBREED; Jill Janus, HUNTRESS; Dave Lombardo, DEAD CROSS; and Eddie Hermida of SUICIDE SILENCE all were on hand for the historic announcement. 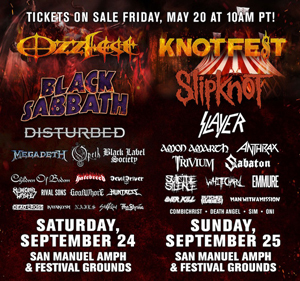 The line-up for OZZFEST MEETS KNOTFEST, Saturday, September 24 (OZZFEST) and Sunday, September 25 (KNOTFEST), at San Manuel Amphitheater and Festival Grounds in San Bernardino, CA, is as follows, with both OZZFEST and KNOTFEST dedicating a stage in honor of their departed comrade Lemmy Kilmister of MOTORHEAD. Saturday's OZZFEST will be headlined by BLACK SABBATH--marking their last Southern California performance ever as part of the band's final tour--and Sunday's KNOTFEST bill is topped by the festival's namesake, SLIPKNOT. In the longtime OZZFEST tradition of continuing to support the music for which it was created, both line-ups will again feature many acts that OZZFEST and KNOTFEST fans have seen at previous outings in both the U.S. or internationally. OZZFEST alumni appearing this year include Black Sabbath, Disturbed, Megadeth, Black Label Society, Hatebreed, DevilDriver, Goatwhore, and Kataklysm, while Sunday's KNOTFEST bill will feature OZZFEST alumni Slipknot, Slayer, Anthrax, and Trivium. KNOTFEST returning artists include Slipknot, Slayer, Amon Amarth, Anthrax, Trivium, Suicide Silence, Butcher Babies, Man with A Mission, Whitechapel and SIM.